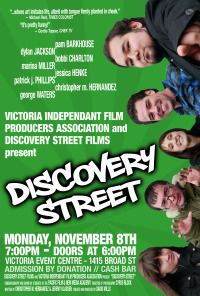 The web series "Discovery Street", which I co-wrote and edited, will be screening on Monday, November 8th at 7:00pm in the Victoria Events Centre as part of the Victoria Independant Film Producers Association's Take2 Screening series. Doors open at 6:00pm to the public for a meet and greet, followed by the admission-by-donation screening at 7:00pm. The show runs approximtely 30 minutes, and there will be a short Q&A with myself and the creator/director David Mills after the show. There is a Facebook event page for the screening here. Hope to see you there!